The U.S.-U.A.E. 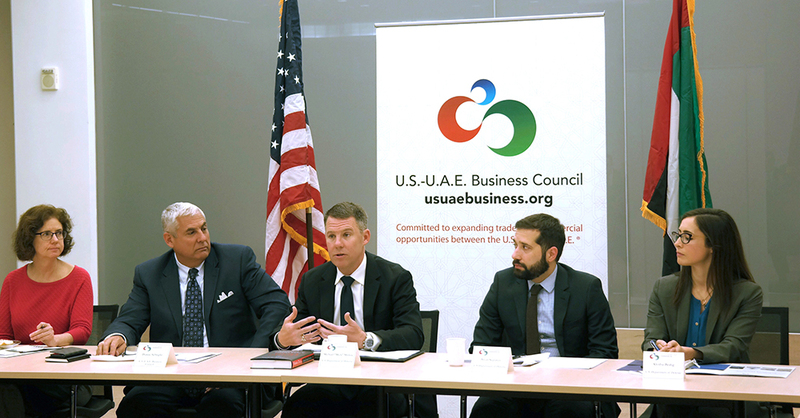 Business Council hosted recently appointed Deputy Assistant Secretary of Defense for the Middle East (DASD) Michael Mulroy for a roundtable policy breakfast on the 19th of April in Washington, D.C. The breakfast provided private-sector stakeholders in the defense industry with an opportunity to hear from Mr. Mulroy on the current contours of the U.S.-U.A.E. defense and security relationship. Mulroy discussed the United States’ current defense strategy and its implications for the Middle East and North Africa. He also outlined the importance of the U.A.E. as a capable partner with numerous shared policy interests including combating terrorism, extremism, and cyber terrorism in the region as well as countering Iranian regional expansion. “For the United States to implement our National Defense Strategy, we must work by, with, and through capable partners like the United Arab Emirates,” said Mr. Mulroy. U.S.-U.A.E. Business Council President Danny Sebright facilitated a discussion on key regional issues, including the fight against ISIS in Iraq and Syria, the ongoing conflict in Yemen, increasing cybersecurity threats, and heightened tensions in the Gulf. Stakeholders were given the opportunity to engage Mr. Mulroy on U.S.-U.A.E. defense and security cooperation, and the DASD sought audience members’ perspectives on opportunities and challenges facing American businesses in the region. Click here for more information on the U.S.-U.A.E. Defense and Security Relationship.